The Library is great place to research military history, whether you're looking into military events, units, or learning more about an individual. 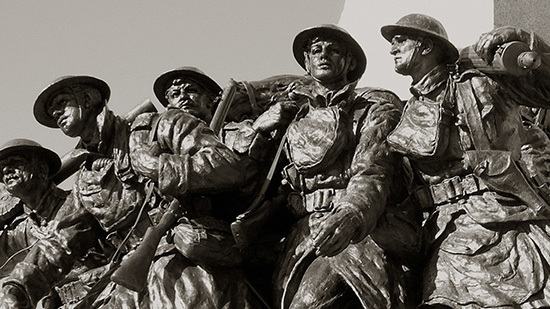 We have histories of military units, wars, monuments, recommended reads, and much more. Central Library is home to the Books of Remembrance, 3 commemorative volumes that memorialize local people whose lives were lost at war. These books can also be viewed online. We offer free, interactive 'Lest We Forget' workshops that help participants learn about World War 1 through the stories of the local men and women who lived through it - soldiers, nurses, maybe even one of your relatives. Halifax's first public library, the Spring Garden Road Public Library, was built as a testament to all who fought to safeguard freedom of speech and freedom of study. This living memorial was a fitting reflection of the community spirit and democratic ideals upon which public libraries are built.